U.S. Immigration and Customs Enforcement this week confirmed to the Washington Blade that it is currently housing 45 transgender women at a privately-run detention center in Texas. Danielle Bennett on Tuesday said the trans women are being held at the South Texas Detention Complex in Pearsall, Texas. The GEO Group, a Florida-based company, operates the facility that is roughly 60 miles southwest of San Antonio. 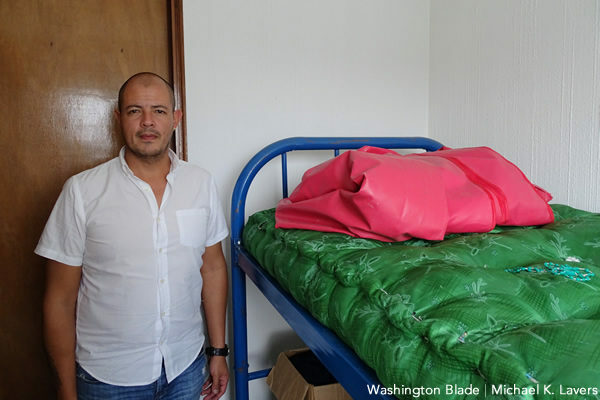 The Blade first learned about the trans women at the facility on Feb. 1 during an interview with Estuardo Juárez Moscoso of Asociación Lambda, a Guatemala City-based advocacy group that provides assistance to LGBTI migrants. Bennett told the Blade that 111 “self-identified transgender individuals” were in ICE custody in 20 facilities across the U.S. as of Feb. 4. She said there were “self-identified transgender individuals” at the Cibola County Correctional Center, a privately-owned prison in Milan, N.M., that has a specific unit for trans detainees, as of the same date. Roxsana Hernández, a trans woman from Honduras with HIV, had been housed at the facility before she died at a New Mexico hospital on May 25. Moscoso said Hernández received medication from Asociación Lambda when she at its Guatemala City headquarters before she and a group of other migrants traveled to Mexico. U.S. Sens. Kamala Harris (D-Calif.), Tom Udall (D-N.M.) and Martin Heinrich (D-N.M.) in a letter they sent to Acting ICE Director Ronald Vitiello and U.S. Customs and Border Protection Commissioner Kevin McAleenan on Dec. 5 cited reports that indicate Hernández “endured freezing temperatures and was denied adequate food, water and medical care” while in custody at the San Ysidro Port of Entry south of San Diego and “vomited” while ICE transported her between facilities. The initial cause of Hernández’s death was listed as cardiac arrest, but the results of a second autopsy the Transgender Law Center commissioned shows Hernández was beaten before she died. “When I found out the news (that she had died) it was very impactful,” Moscoso told the Blade. Immigrant and LGBTI rights advocates over the years have sharply criticized ICE and the U.S. Department of Homeland Security, which oversees the agency, over its treatment of those who are in their custody. Homeland Security Secretary Kirstjen Nielsen continues to face calls to resign over the implementation of President Trump’s immigration policy that includes the separation of migrant children from their parents and demands for a wall along the U.S.-Mexico border. Bennett has previously described allegations that Hernández was abused while in ICE custody as “false.” Andrew Lorenzen-Straight, the openly gay deputy assistant director of ICE Enforcement and Removal Operations Custody Programs, defended his agency’s treatmentof trans, lesbian, gay and bisexual detainees when he spoke with the Blade at ICE headquarters in D.C. on Dec. 18. “LGBTI care is of paramount importance to us,” he said.